SUBHEAD: Schulz models much of what he builds on the Japanese aesthetic - make everything in life not just functional, but beautiful. Image above: Front entrance of 200sf structure built from local materials. Still from video below. Brian is an "obsessive craftsman" who believes he can build most anything in his life. On his Oregon farm he has built, or renovated, five tiny structures. After being told by the county that he couldn't erect a yurt, he built a code-approved main house "to give us a place to legally stay". The farm is completely off the grid and Schulz points out that this doesn't mean they rely on propane or lots of photovoltaics. Nearly all their tools for living have been adapted to fit the off-grid lifestyle. For his prototype solar-powered bathhouse Schulz used recycled solar hot water panels, salvaged hot water tanks (from the dump), a solar thermal window and a recycled soaking tub. Indoors, Schulz has adapted a chest freezer to create a low-consuming refrigerator (using a tenth of the electricity of a regular fridge) and a 1940s wood-fired cookstove to cook, heat and as a heat-exchanger, harvesting waste heat and thermo-syphoning water to heat up the home's hot water. 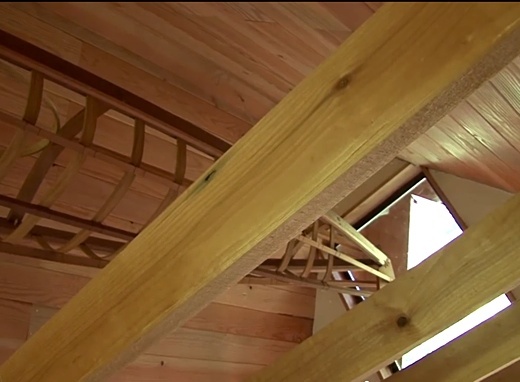 Image above: Hand-crafted kayak frame on rafter ties below ceiling of structure above. Still from video below. 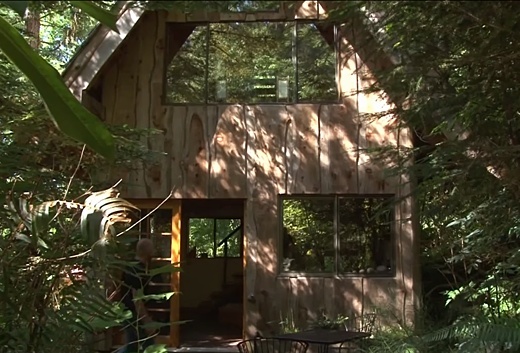 Video above: Tour of off-grid Oregon organic farm, kayak workshop and home. From (http://youtu.be/7DSQ0W2lwtw).